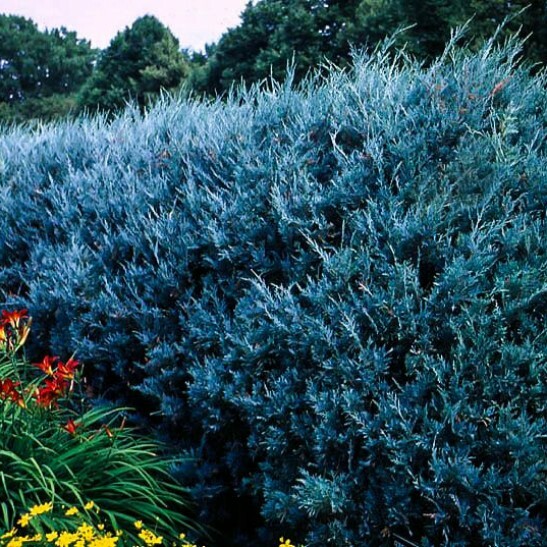 If you want a hedge that will never need water once established, or trees that can be left to grow into an attractive screen or wind-break, the Wichita Blue Juniper is the right choice for you. It is a great plant for hot, sunny areas as this tree thrives in hot, dry conditions. 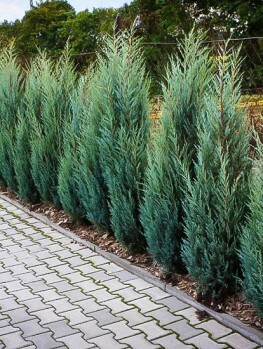 Wichita Blue Juniper is an upright, evergreen tree very suitable as an accent specimen, as a hedge or as a screen. It can grow as much as one foot a year when young, but it is long-lived and will make a permanent hedge that will survive all kinds of weather and be attractive all year round. 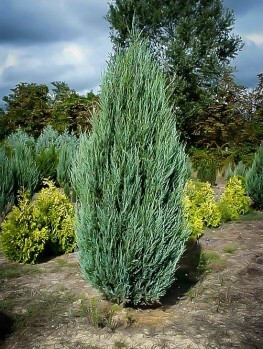 Wichita Blue Juniper is an attractive evergreen needle tree, with rich blue-grey foliage that retains its color throughout the year. It does not turn brown even in the coldest winters, as some evergreens do. 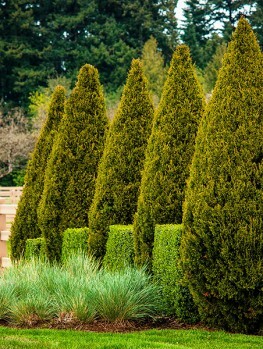 Because it is evergreen it is an idea choice for a hedge or screen that will function throughout all the seasons. As a specimen-tree it will be especially beautiful in winter when other trees have lost their leaves and color is hard to find in the garden. It resists snow, drought and heat and is pest-free. It grows at a moderate rate of up to one foot a year when young, slowing to six inches a year or less as it matures – so it will never get out of hand and overgrow your garden. This is a great choice if you are looking for trees that will survive in hot, sandy and dry conditions without needing extra water after the first year or two. 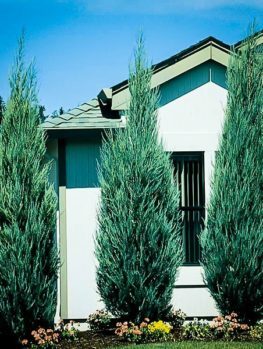 Juniper Wichita Blue is pest-free and withstands severe cold in northern states or at higher altitudes up to 8,500 feet. It has no pests and will be disease-free as long as it is not in wet soil or shade. If you travel through the Rocky Mountains you will see the wild form of this tree growing in dry, rocky places. It is called Colorado Red Cedar (Juniperus scopulorum). It grows up to 50 feet tall, but the form we sell –‘Wichita Blue’ – doesn’t get much taller than 15 feet, although some very old ones can eventually reach 30 feet if left unclipped. 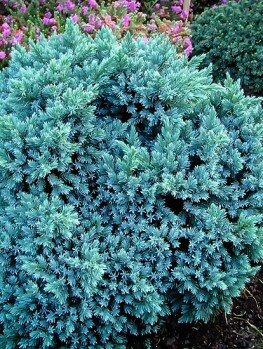 This beautiful form has much bluer foliage than the wild trees of the Rockies, so it is more attractive in the garden. A mature tree is shaped like a tall pyramid, with a very short trunk. 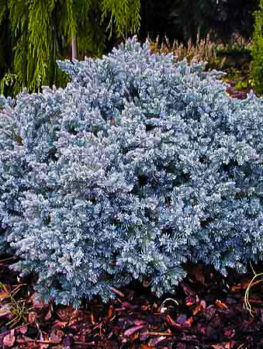 It tapers to a point and has dense, blue-gray foliage almost down to the ground. 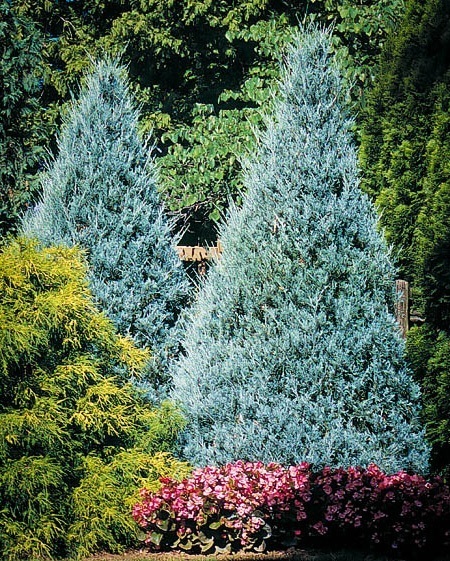 As ‘Wichita Blue’ is a male tree, it produces no cones, which means the tree stays clean and neat in appearance. Older leaves drop eventually inside the tree so there is very little to clean up. If you have clipped this tree every year or so it will be very dense and of course with clipping you can keep it narrower or broader as you wish. It can be clipped into a hedge, or a rounded shape, rather than a pointed one, if you wish. You can clip this tree at any-time of year, but early fall is the best time, to be sure there is no winter damage to a freshly-trimmed tree. It is best to trim frequently – at least once a year, as this tree cannot be cut back to branches that have no leaves on them, as they will not re-sprout. For a hedge, make sure you keep the top narrower than the bottom, so that it will stay green right to the ground, an also so that snow will not build up on the top, which could possibly cause it to break. Juniper Wichita Blue is hardy from zones 3 to 7, so it will grow throughout the cooler areas of America, in all states except the Deep South, Florida and coastal California. It will thrive even on the driest, sandy soils but it will be happy in every type of soil except for those that are regularly wet. So if you have a dry garden, hate watering or have sandy soil that dries out quickly, this tree is a great choice as a specimen or as a hedge plant. It will tolerate much drier conditions than most other hedge evergreens. 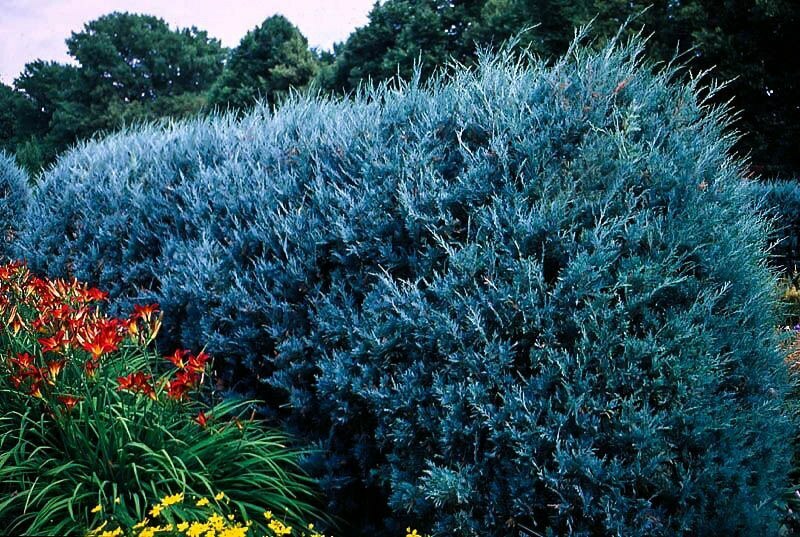 If you are using your Wichita Blue Junipers as a hedge or screen, plant them 3 feet apart. Dig a trench and line the trees up in the trench. Put back most of the soil, and then firm it well around the trees. Flood the trench with water and when it drains away put back the rest of the soil. Water well each week for the first month, then only when the area seems dry. Once established these trees will stand long dry periods without water. For a specimen, allow 8 feet or more of room for the tree to mature and to be able to appreciate its form. Juniper Wichita Blue does best if sunny locations. Too much shade will make the foliage thin and open. Shady areas are often damp, and this tree is very tough but it does not like damp soil. If you see scattered brown branches on your tree, especially in spring, then it is getting too much water or shade or both. However even large trees can be moved, so find a sunnier spot in your garden for it. 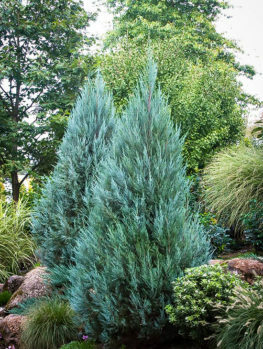 Juniper Wichita Blue is a specially selected form of the tree that keeps to a smaller size and has better foliage color. So it must be produced directly from trees known to be true to that form. Our trees are grown the correct way, from branch cuttings. That way each one of our trees are identical to the original, and will produce a very uniform effect when grown in groups or rows. However, these take longer to produce, so avoid cheaper, seedling trees that will only be a disappointment. We sell only trees that are true to the original form and we have a wide range of sizes to give you the best plant for your purpose. However we are constantly renewing our stock so our customers get fresh, healthy plants, so supplies of this tree may be limited. To avoid disappointment order now.